With that in mind, Rick James explains his philosophy and approach to siting industrial wind turbines. He went on to explain that focuses on the science, not the client. To him a wind turbine is simply a machine that produces industrial type noise that can be analyzed. It is in the analysis that he differs with the MOE and the wind proponent, Kent Breeze (Suncor). Although the AG’s lawyer, Andrea Huckins and Suncor’s lawyer, Albert Engel, continued to to try to to discredit Mr.James qualifications, when it came time for cross-examination, it was clear that they are no different than any other lawyer in that they hate expert witnesses. The witness knows the subject far better. That’s why they try to get them dismissed. So into the quagmire of sound measurement they waded, and I don’t think too happily. A few pokes about the ISO standard 9613-2 and how the standard does not specify a “tolerance adjustment.” To which Mr.James replied that any competent sound engineer would use a 3dB adjustment as a matter of “standard practice.” Ouch! one snag. Further, Mr.James noted that the ISO standard used for ground attenuation (how much the sound is reduced by interacting with the ground) is really only valid for a noise source no higher than 30-40m, and hub height of turbines is 80 -100m. This is a known weakness of the calculation and really the MOE regulation needs revision to be accurate. 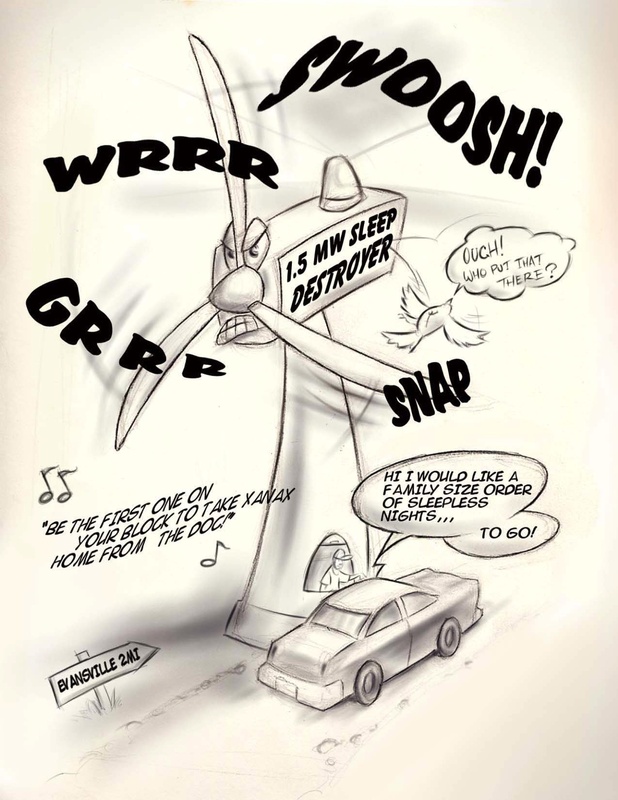 His point being that wind turbines as a noise source are so high that they are more like aircraft flying overhead – one that repeatedly circles the area. Curiously MsHuckins also beat this “dead horse” too. In this case she stated that the “tolerance adjustment factor” could be either -3dB or +3dB – and Mr. James asked rhetorically,”You want the worst-case scenario?” With his quick, direct responses, Mr.James threw them off their game. One might suppose that the engineers Suncor provided Mr.Engel would have given him better ammunition – but instead it was more like wet gunpowder and failed to ignite. I don’t think they earned their account charges for their time. Mr.James also explained the factor that wind shear has. Essentially this is a “stable air” phenomena. During the day, the earth warms and by convection air currents increase and mix up the atmosphere to a considerable height. This means that the wind speed at ground level is very near the same as it would be at 80m. At night, the earth cools and no convection occurs. Ground wind is very light or nothing at all. However, winds at upper levels are still blowing. The greater the shear factor the greater the difference between ground speed and upper level speed. Commonly throughout Southern Ontario, the factor is ~ (0.40) and in Kent Breeze the figure stated is ( 0.420 . At this level, a 5m/s ground wind translates into 12m/s at the 80m hub level – this means that the turbine is at full power, while the ground level wind speed is still low enough that no penalty for increased ground level wind speed can be applied in the Ontario regulations. So the picture is: a dead calm summer night, but turbines honking away at full power and noise. As Bill Palmer once wrote, “…you wouldn’t put up wind turbines in a place where there was little wind shear.” – Shear guarantees that they’ll work – a dirty little secret the wind industry would rather keep to itself. Vandenberg estimated wind shear occurs ~ 47% of nights. Mr.James spent time demonstrating how wind turbine sound is clinically more annoying than other types of industrial noise. What is intriguing is that according to studies done by Pedersen and Vandenberg, annoyance starts with levels just above background noise – an unusual fact in itself. He believes it is a combination of factors, principally the impulsive nature of the sound – the “swishing/ thumping” repetitive noise and the high amount of low frequency noise (LFN) and especially infrasound. What makes both worse is the cyclic modulation of the LFN and infrasound. He pointed out the threshold of perception for infrasound was crossed, a slight increase (1dB) would trigger a reaction in a subject. Now with Alex Salt’s infrasound work, it is known that the stimulation threshold is lower (60 dB) than what was previously thought possible. Commonly, values from wind turbines are 70 dB or more. Mr.James spoke to me some of his work with “sick building syndrome” in the 1980′s recalling in particular, ” … 3 and 4 storey apartment buildings in which tenants would enter and literally run through the hallway to their apartments to avoid the onset of nausea.” – it was that dramatic! Of course, modifications to the fans in the heating/ventilation system eliminated the source of infrasound and eliminated the problem – can’t do it with horizontal axis wind turbines – a mature technology with nowhere to go. A further complication of wind projects is “multiple infrasonic tones” and increased sensitivity. No research in this area,yet the condition exists with multiple wind turbines “beating” in close harmony. He went on to explain that amplitude modulation causes sound to be perceived as more annoying even though the it may be no louder in actuality. Wind turbines produce slight amplitude modulation during the day (~ 1-2 dB). Under high wind shear conditions at night there is little or no “masking”effect. Shear produces greater lateral pressure differences which bends the blade somewhat and so amplifies the “swishing” sound into a distinctive “thumping” which can be from 5 dB to 10 dB and even higher if shear is extreme. Currently, the predictive models in use insert only the minimal “daytime” values for wind shear. Mr.James maintains from the extensive field-test results he has seen that a more accurate figure of 5dB should be used at the very least. In summary, Mr.James asserts that the the “tolerance factor” or 3 dBA should be added into the assessment and additionally 5dBA for the wind shear effect creating “thumping” sounds for a total of 8 dBA that should be additionally assessed as a sound penalty. He doesn’t dispute the 40 dBA limit. He maintains that the MOE has not accounted for these factors in its guidelines. 8 dBA would put 114 homes in the Kent Breeze project over 40 dbA and thus out of compliance. As you can see, there is a lot of detailed information making this issue of sound very obtuse. The 2 panel members listened attentively. This is just a taste of what is yet to come. Posted on February 9, 2011, in Environmental Review Tribunal, Green Energy Act, Health, Ministry of Environment, Suncor, Take it to court, Wind Developers-Proponents. Bookmark the permalink. Leave a comment.